Although you can certainly crochet in rows, many crochet projects are made using motifs. Motifs in different shapes create all types of different effects in their projects. While most people have crocheted squares and many have also made hexagons, not as many crafters have learned how to crochet pentagons. These free crochet pentagon patterns offer many opportunities to make things that are different from what you typically craft. By far the most well-known crochet motif is the granny square. There are granny variations of almost every shape - granny circles, rectangles, triangles, etc. This same basic technique can be applied to make a granny pentagon. Like the granny square, it is worked in the round using double crochet stitches, but of course it has five sides instead of just four. 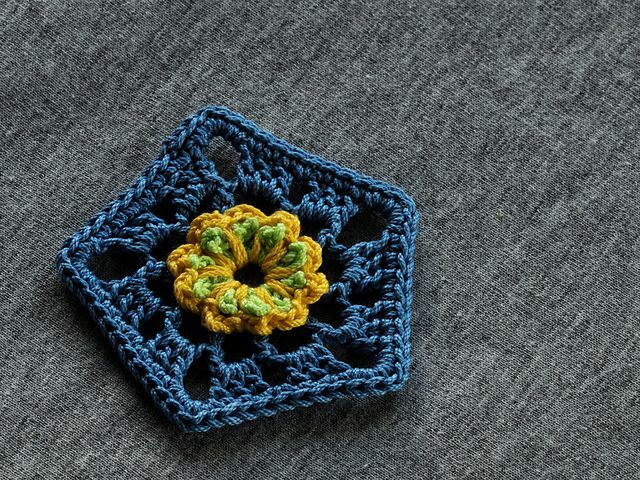 The most common variation on the crochet granny square is to add a flower in the center of it. It's no surprise that you can do the same thing with a granny pentagon. The designer explains that it takes some effort to turn crochet pentagons into blankets, because of the nature of the shape, but says that she loves to use a few of them together to create small projects including bookmarks and pincushions. Would You Like Yarn With That? Think about crochet squares; not all of them are granny squares. Likewise, there are plenty of crochet pentagon patterns that aren't based on the granny stitch motif. This is an example of a pentagon with a flower in the center that has a more solid stitch pattern. This is perfect for making projects that you don't want to be so lacy. When you want a really solid crochet pentagon, the best source comes from this free bunting pattern. The project shows you how to make a basic pentagon, outlined in a second color for graphic appeal. It also shows you how to string the bunting together to create an array of different garland options for any occasion. The sunflower is such a fun flower and one that really brightens up crochet projects with its bold shape and color. This pentagon embraces that happy flower. You can also make the design in neutral colors for a subtler effect. This is a bilingual crochet pattern so scroll down the page for English instructions. You can learn how to work a variety of shapes into the center of a pentagon. This pretty project uses a star at the center. It also shows how the pentagon can be turned in different directions to create a shape that points up or down (or to the side for that matter). This multi-color crochet pattern is part of a project to create a tasseled crochet wall hanging that is perfect for a nursery. Once you start crocheting pentagons, you'll be surprised at just how many different ways there are to create this basic shape. This two-color ten-round crochet pentagon is made using only the basic crochet stitches (single crochet and double crochet) in unusual combinations. This is a powerful graphic design that would be perfect for making everything from coasters to accessories. Heidi Bears is known for her variety of African flower crochet patterns. She combines these in countless ways to create a range of different animal patterns that capture the imagination. She provides a free pattern for creating the basic pentagon-shaped African flower. 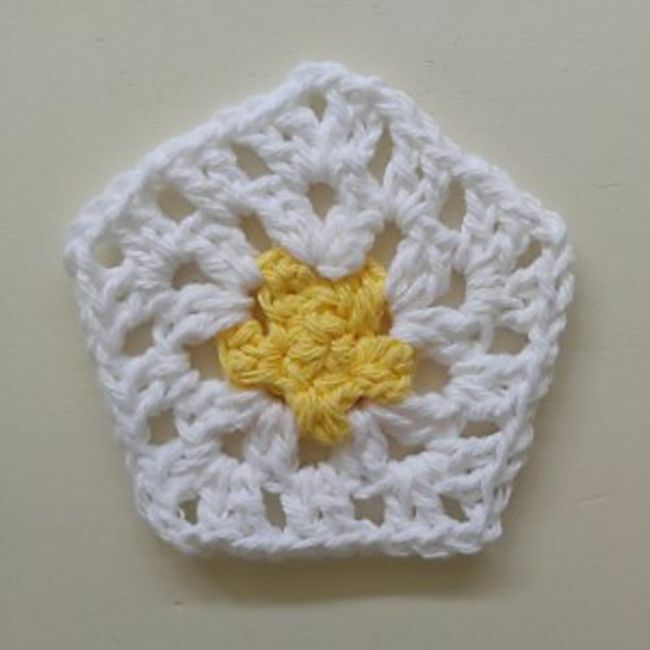 This is a five-round crochet pattern, for which she includes both written instructions and a symbol chart. So, can you use pentagon motifs to make a big crochet project like a blanket? This amazing free blanket pattern shows that you can! It looks really complicated, but when you use this crochet pattern you'll actually learn how to make a super simple three-round crochet pentagon. You'll make a whole lot of them in three different colors, and you'll combine them in a specific layout alongside two types of stars and a set of crochet diamonds. If you weren't sure before whether or not crochet pentagons could be impressive, this pattern should clinch it for you. In addition to crocheting the pentagon as a motif, you can actually crochet a stitch pattern based on the pentagon. Called the pentagon stitch, this vintage stitch pattern uses clusters of double crochet stitches mingled with strategic spaces to create the illusion of pentagons. In this way, we've come full circle, because the granny stitch is also made using clusters of double crochet to create squares separated by spaces! 35 Free Crochet Afghan Square Patterns Organized By Size!